Over the past six months I have heard many aphorisms about death and loss as it relates to the right of passage that is losing your mother. Most of them sort of fall around me unexamined because I think my mother’s death was (as every person’s death must be) unique. But there is one that has stuck with me, sort of floating about my head reminding me that I am, once again, motherless, and in turn reminding me how lucky I am to have been taken in and raised by my mom. It is the idea that everyone is a child until they lose their mother. This has rung very true for me, echoing in my head as I sing my daughter the same lullaby my mom sang to me, or as I teach her to bake the rugelach I ate as a child. I feel like an adult, in the roundest sense of the word. I make all the decisions and I pass on all the lessons; grandma Gigi is gone, her lessons will only be passed on through me and the one letter she wrote Scarlet after she was born. My childhood is a memory only my sister shares. But in recent weeks, as I’ve felt ready to delve into the possessions my mother left to me and my daughter, I’ve discovered that there is one thing that makes me feel like a little girl again, like I’m being privileged into the world of adulthood with my mother’s permission. And that is touching her jewelry. My mother was a bejeweled woman. She wore at least one ring on each finger on each hand, every day. She wore three necklaces at all times. She sparkled and gleamed like an Egyptian pharaoh on those rare occassions she dressed up for an evening out. She kept a safe at the bottom of our house, filled with golden treasures from my father, my grandmother, and great grandmothers. Every now and then after my insistent whining, she would open it up and let me touch everything, enchanting me with tales of her youth in New York City and the wealth and glamour she remembered from a very different time. 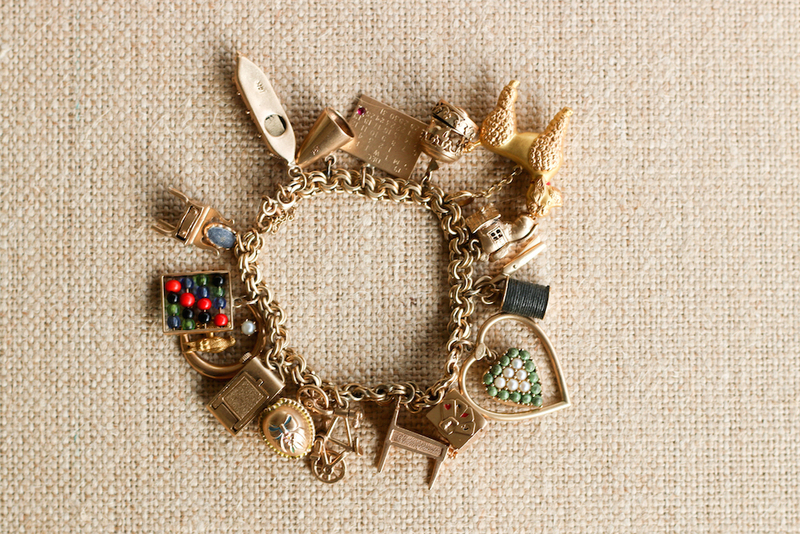 My favorite of her entire collection was the charm bracelet pictured above. Her mother made it for her, adding to it over the years, and there was nothing more I wanted then to have it for my own. My mother gifted me many jewels over the years; a simple, classy, timeless item of jewelry was her idea of the proper way to honor a significant birthday (a sapphire ring for my 13th, a string of pearls when I turned 16), but the charm bracelet was hers. I was so enamored of it that I started one for Scarlet when she was born. I should probably have saved for college instead, but I felt that this bracelet was a symbol of love and acknowledgement of the events in her life that would last more than the toys or dolls she would want every year. It was the magic of a lifetime, distilled into a very specific, feminine form; a scrapbook or photo album from a time before facebook. And giving Scarlet her charm each year made me think of my mother as a child, building this bracelet with my grandmother, her little face lighting up with the excitement of nostalgia for the past year, even at such a young age. Of course, now I realize that charms and bracelets and gold and jewels are just things. They aren’t my mother. They aren’t me. They won’t be anything more than a story for Scarlet, but won’t it be the most memorable story of my mother for her? The tangible, precious thing she was given that is also a trip through a different kind of childhood, her grandmother’s youth. My mother’s charm bracelet stayed locked in that safe until this July, a few days before she died. When all of her children and their wives were gathered together, she divvied it up, sharing with us some memories and watching as we oohed and aahed and cried and cried. 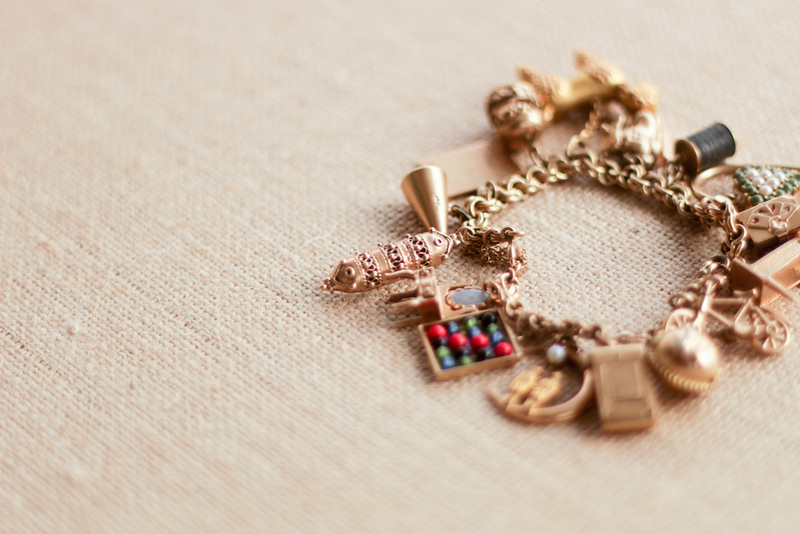 She filled a box with treasures for Scarlet, and in that box was this bracelet. Oh, I could tell you so much about each charm, the things they can do, the magic of a miniature. Maybe I will soon. She also left us some other beautiful things. 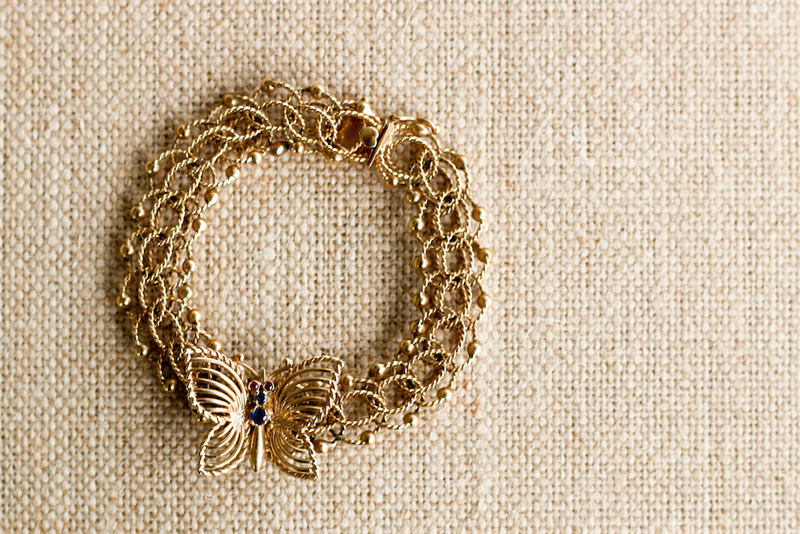 This butterfly bracelet is Scarlet’s favorite. I only just now noticed the heart on the clasp. My mother gave me these earrings when I was 18. She told me that her mother gave them to her when she was 12, but I wasn’t responsible enough yet to have them. She was right. And even after giving them to me, I asked her to put them right back in that safe. I am still afraid to wear them, though I did once. It’s okay to own something so special you don’t use it; I see that now. I used to think she was crazy for keeping all the most beautiful things of our family locked away, but I understand today that their real value is actually being realized now that she is gone. That by saving them, she made sure I would have them when I needed them most, to remember her. It makes sense to me as an adult. My mother gave me a lot of turquoise over the years because she knew I loved it. But she saved this. I will wear this occasionally because it has a backed up clasp chain. I had it cleaned and tweaked to make sure it works. These may be my favorite of all the things my mom gave me. I have never seen her wear them. Big earrings weren’t her style. They must have been my grandmothers. I am too nervous to lose one, I will enjoy these by holding them and showing them to Scarlet when she begs. Maybe I will wear them on Valentine’s day just around the house. 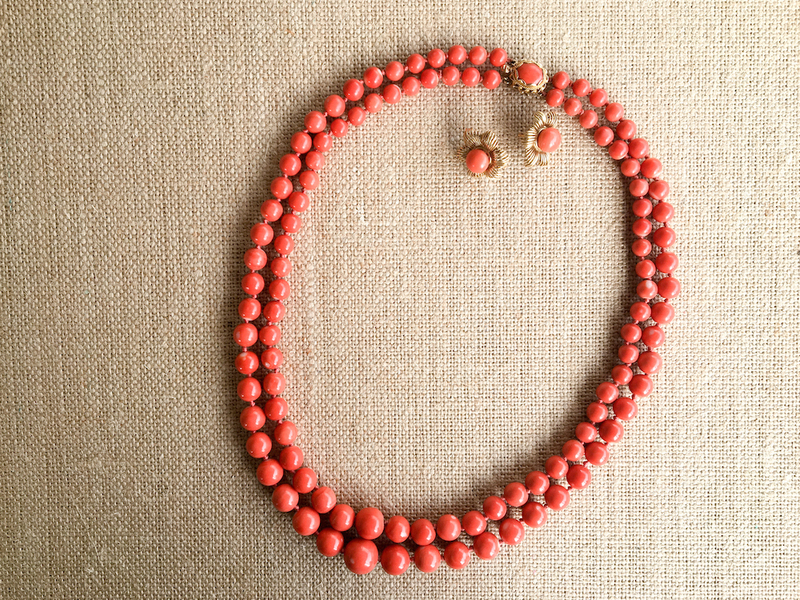 I know this set was my grandmother’s because it made her red hair seem even more vibrant. It is made of jasper and the matching earrings are glorius. 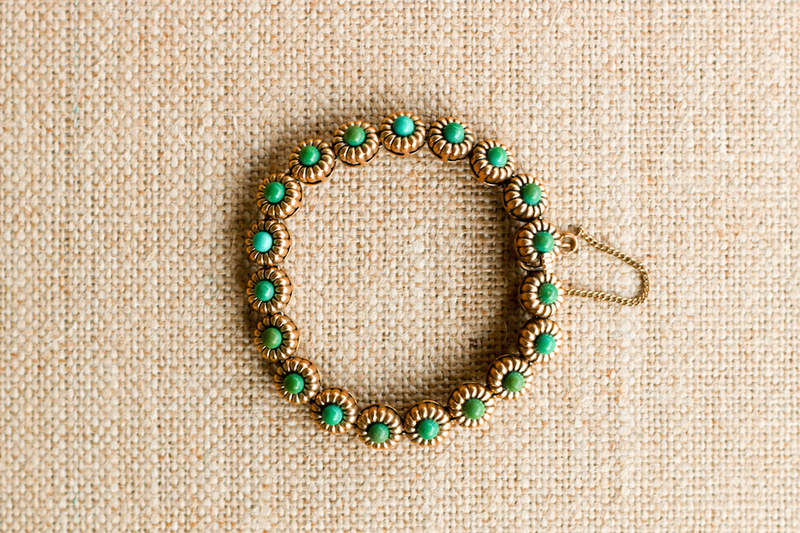 The clasp alone is something to admire – my mom was right when she said they don’t make things like they used to. This is a treasure I was never allowed to touch, so I feel the most young when I hold it. 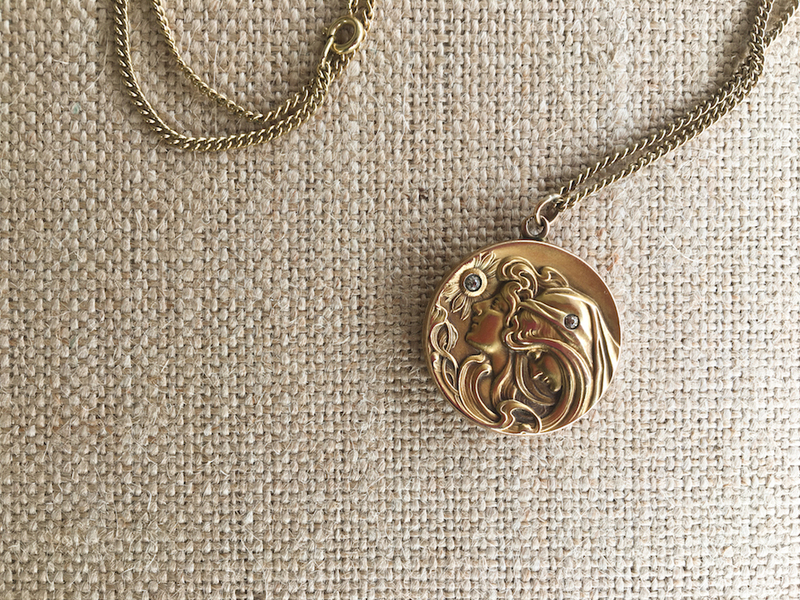 It is an art nouveau locket from the 1920’s. The back is engraved with my great grandmother’s initials, SS, for Selma Solomon. The pictures inside have been lost to posterity, but before she died my mother told me that she lost her grandmother Selma at age 8, and it broke her heart. Scarlet was only 7 when my mother died, and she saw a similarity there. The scripted S on this locket is why she left it to my daughter. This was my mother’s teething ring. 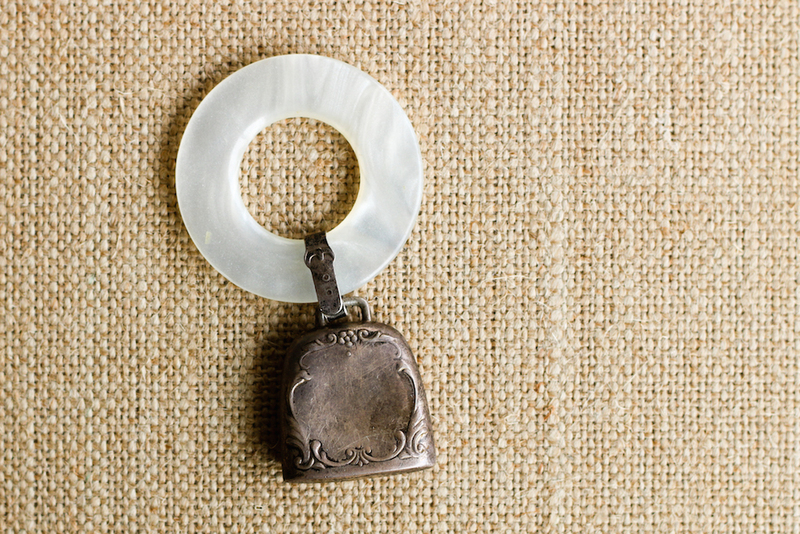 It is made of (I think) mother-of-pearl and sterling silver. It was a gift from her grandmother, and she left it to me to give to my grandchildren one day. Of course no baby will ever bite down on it again, but through this heirloom my daughter and I will share a memory of my mother when I become a grandmother. And if you are curious, here is the charm bracelet I started for Scarlet when she was 2. She is seven now. I will share more about what each charm means at another time. It is all gold (maybe I made a bad choice in mixing my gold colors); some of the charms are vintage finds I hunted down on ebay or came across at an antique shop, and some are new, selected to represent what happened in Scarlet’s life that year. All are probably way too expensive and ridiculous to give a child. I keep the bracelet locked in a safe and let Scarlet hold it on her birthday every year, or take it out when she asks, then lock it right back up. Maybe my mother and I are not as different as I always imagined. Maybe the glamour, grace, and generosity of my mother are the qualities that Scarlet will remember. Maybe through these charms my mother’s death will be made magic and her spirit everlasting. Thank you for saying that. My mom was pretty awesome. What a beautiful tribute to your mother. I think Scarlette will always cherish that bracelet. My mother had one and I remember her letting me play with the charms sitting beside her in church. I have one that my mother started for me. I hardly ever wear it but I still love to look at the charms. Oh, I love to hear that you still love the one your mother made you. I wish I could see all the charms and hear the stories! That’s so sweet! 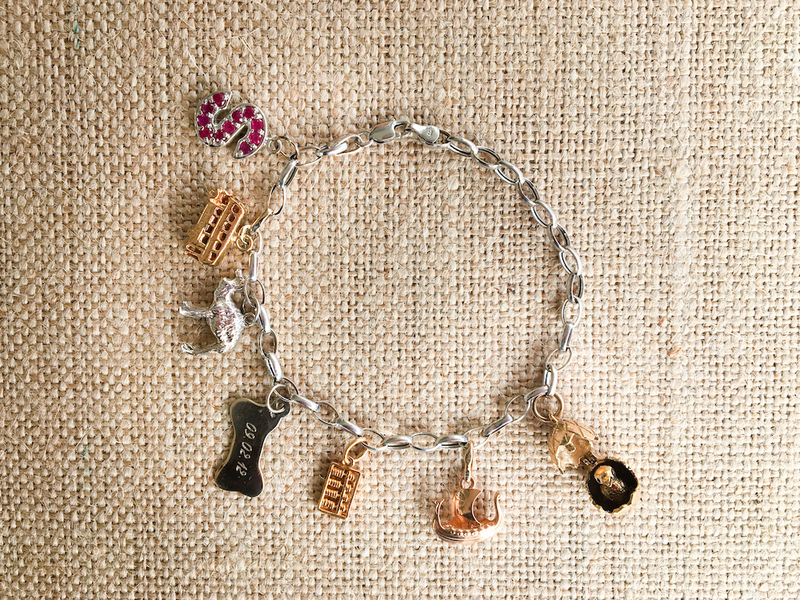 I have started charm bracelets for each of my two daughters though it is a secret, one I will surprise them with (perhaps on their 16th or 18th birthdays?). I don’t have the chain yet, just a collection of charms – something special that stands for something each year (for instance, a dancer for starting ballet classes, a book for when the oldest started reading, a strawberry since that happened to be a favorite fruit and we went strawberry-picking, etc.) I feel like my son gets jipped, since I can’t think of a meaningful collection for him. He already has tons of legos and matchbox cars, and those aren’t a secret! Oh, keeping them a secret is such a wonderful idea! What a great surprise for them. I wonder what the equivalent could be for boys. Hmm. I am sure he will still love his matchbox cars when he is grown. I will have to ask around because I am really curious now! A beautiful piece, a great tribute to your mom. Such treasures. I must admit, I have been a bit remiss at reading Pretty Prudent as of late. 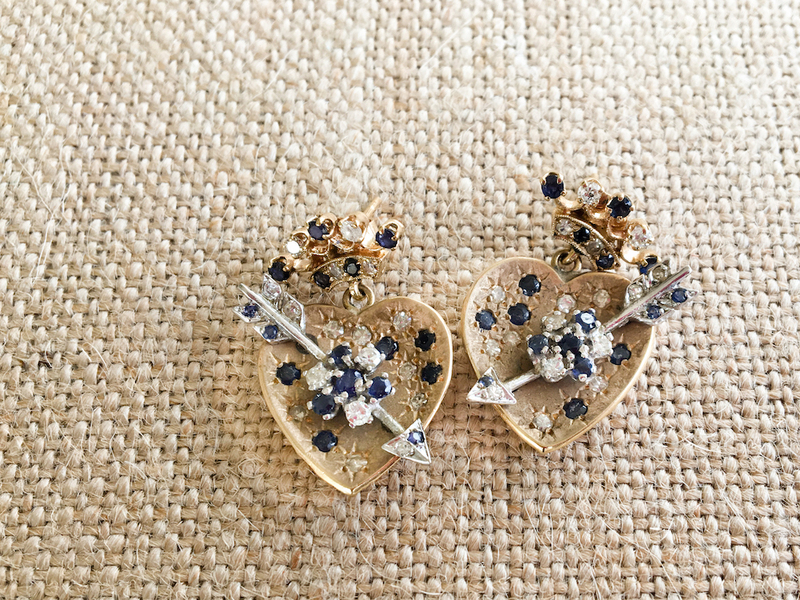 I blame it on garden variety busyness, so I was blown away by this lovely tribute and walk-down-memory-lane via your mother’s jewelry collection when I popped back onto the PP page. My grandmother had 8 children and 8 grandchildren – she had a silver charm bracelet with a silver baby bootie for each of us. Vivid are the memories of getting to sit next to her during Mass and being able to examine each one for the initials and birthdate that it had inscribed on the sole. 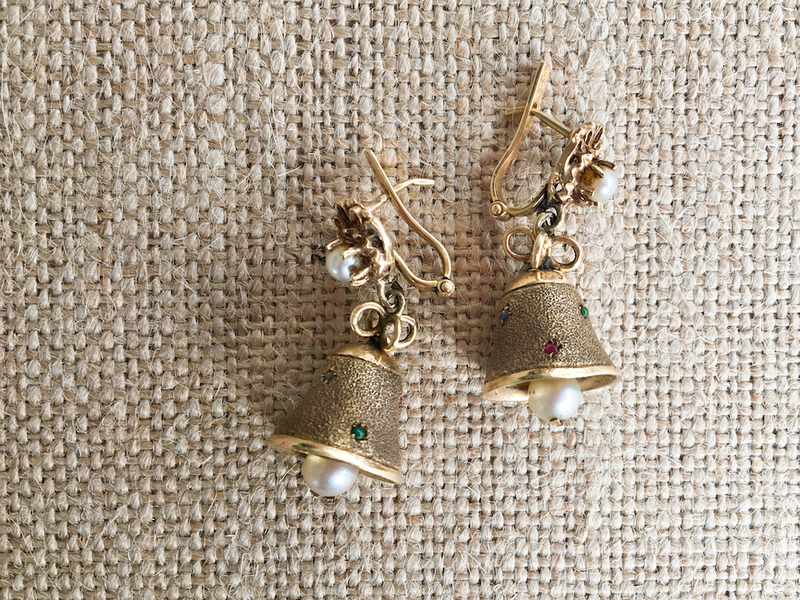 Your post also brought back memories of sitting down with my mother’s jewelry box that contained all kinds of baubles. And finally, my beloved aunt, who lived her adult life in San Francisco and who exuded the spirit and style of San Francisco all of her days, peacefully passed in August. She bestowed on me, over the years, many, many favorite charms for my charm bracelets and other beautiful pieces that are priceless in my eyes. When I wear them, I feel like her spirit surrounds me. Thank you for sharing and igniting such lovely memories! Beautiful tribute to past generations. I would love to mimic the tradition for my own daughters. Do you mind sharing the source of the charm bracelet you are making for Scarlet? Hi Karen! I got some of the charms for Scarlet’s bracelet from Charmco, but they are very spendy! I found some of them on ebay as well.